I have not knitted for a very long time. It's because I'm too impatient. It takes SO long to make the fabric, in the very shape of the (untested) pattern. It fills me with dread and despair. What if it the fabric isn't all that great AND it doesn't fit, or suit the intended wearer? Ack! I content myself with buying the fabric, ready-made, which reduces the variables and the likelihood of abject failure. My oldest (by far) UFO is a knitting project. It has been "almost finished" for over 25 years. It wasn't always so. Once upon a time I did knit. My husband and I spent a year in the UK, during which I was mostly without access to a sewing machine. And in the UK then, great knitting yarn, and fabulous knitting patterns were easier to find. The activity of knitting suited those long nights (Cambridge, where we were living, is WAY farther north than any city in Canada where I have ever lived so has WAY less daylight in the depths of winter) in front of our little electric "fire". I found fabulous vintage knitting patterns, including some gathered into book form and updated. I still have The 30s Family Knitting Book and The Man's Knitting Book - classic patterns from the '20s to the '50s (both edited by Jane Waller). Fabulous. I even made a couple of items out of each. I even knitted the little spots in the body of the sweater (they were blue on the ivory background). The snowflake border was repeated in a little hat with ear flaps and a pompom. SO cute! Well I finished the set before the baby was born and presented it to the parents-to-be, then waited for the blessed event to occur. You can hardly imagine the mixed emotions which came along with the news that the expected baby was born, beautiful and healthy and ... there were two of them. Identical twin boys. 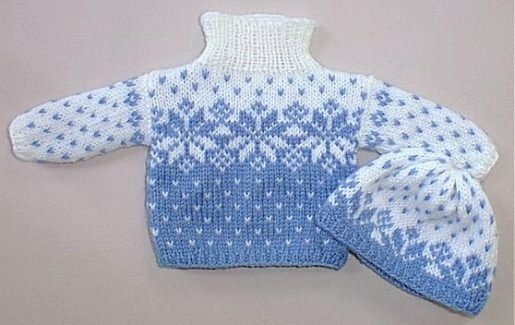 I gritted my teeth and made a second sweater set, exactly like the first one except a different snowflake pattern. Last year, one of the twins became a dad. They sent a link to some photos on Picasa. His little daughter looks adorable in the sweater I made for him 32 years ago. Such a nice surprise to find out they had kept it for the next generation. I'm just popping in to answer a couple of questions posted by commenters on last weekend's Vogue 2770 Jacket Progress post. Carrotsandsmarties asked whether I have a helper to help me fit myself. Nope - I do the first pinning on my handy-dandy duct tape double, and then when it looks weird (as it invariably does) I put the muslin on for a double-check. This process confirms that the weirdness is truly my own. So I don't have to put it on and take it off a million times, as Carrotsandsmarties feared - just once or twice. Vicki asked if taking length out of the CF is a normal adjustment for me or whether it's peculiar to this pattern. Well, it's not something I have to do all the time, but I have done it before. It seems more pronounced in a garment which has a V neck and no lapels, for some reason. I think it is a combination of somewhat forward and somewhat square shoulders, coupled with a forward neck, but I'm not really sure. All I know is that I've come to trust the evidence of improved fit from various tucks. NancyK asked if I had seen the series of articles on alterations that Kenneth King has written recently in Threads. This series is very interesting but I have not attempted to follow his instructions. I did spend quite a long time poring over his diagrams and text, trying to understand exactly what he was doing. It was certainly not self-explanatory, at least to me. I concluded that this is the method that works for Kenneth King but it wasn't going to work for me. That said, his articles perhaps served as inspiration to me in my own quest for better fit, and helped me figure out how to "read the muslin" to decide where I need to add, subtract or redistribute fabric for better fit. 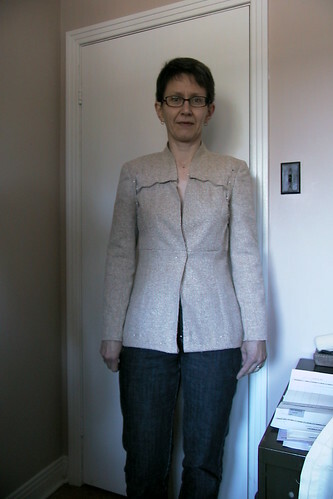 And Nancy, re the fit of my jacket, the pattern is REALLY long (2003-style)! It might not look so long on the envelope but then the model is probably six feet tall... I'm 6" shorter and it wasn't doing much for me, I confess. The good news on the progress front today is that I've cut out the jacket, and have lots for a skirt, and enough besides for a short vest, if the fancy takes me. Sometimes you just have to do what pops into your head, as long as it's legal and reasonably safe that is (the lawyer in me can't resist qualifying that statement...). So I made this T-shirt. The stretch lace was given to me by a friend and fellow-sewer here in the Nation's Capital, and the underlining was in the stash, the result of an earlier gift from another end of the country. The fold-over elastic (FOE) also came from stash. Oh, and I borrowed the pattern (from DIGS). So that makes this little T pretty much cost-free, and it didn't take much time either. Like every other Jalie pattern I have tried, this is a winner. Simple and it fits. What's not to like? And it's a fabric miser. I might have had 70cm of this fabric. There is a bit left over. Because the lace is sheer, I underlined the body pieces with a flesh-tone cotton lycra jersey. The sleeves are just the lace. The illusion is not bad. I hate worrying about whether my undies are showing, and the wind won't whistle through it either. So practical! I finished the neck and sleeve edges with narrow FOE. This is so easy it is just ridiculous. I used a small zig-zag (1.5 x 2 mm). Applying a very small amount of tension to the FOE works best. I traced size S, blending to T at the hip. I cut the neck down very slightly, and cut the sleeves shorter than the short sleeve line marked on the pattern (but longer than the cap sleeve line). I also cut the T shorter (used the size M hem line) because Jalie's Ts are always too long for me. I allowed myself 1.5cm at the side seams for fitting because Jalie's 7mm (1/4") gives no room for error at all. Because the fabric with underlining is a bit less stretchy than many knits, I needed the extra at the bust and hip. 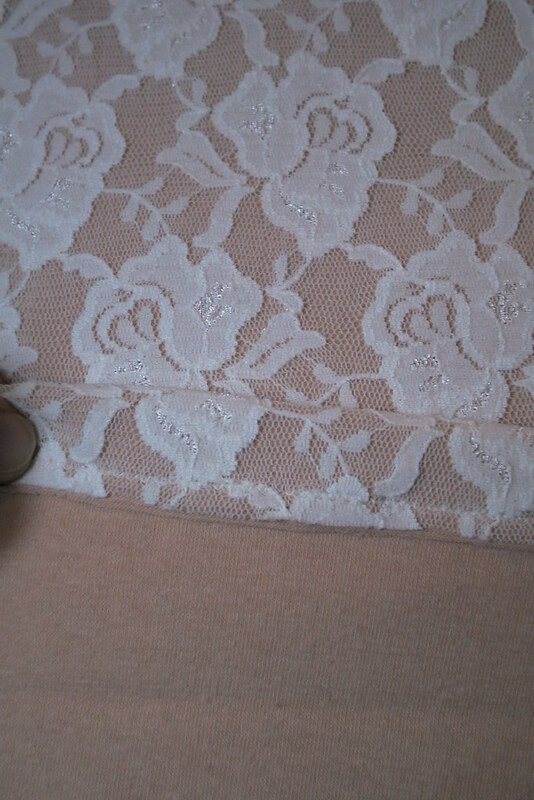 Here is a close up of the lace fabric, with the hem turned up so you can also see the underlining. 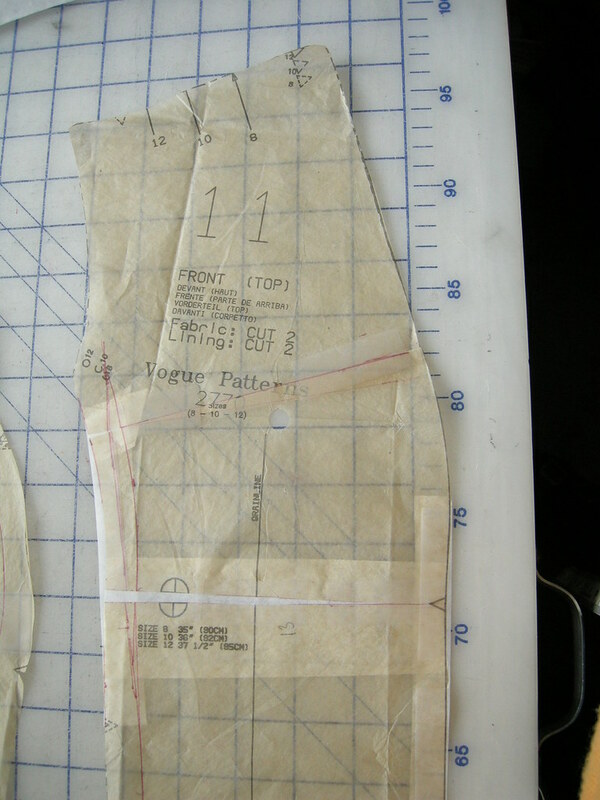 I didn't get a lot of sewing done this weekend, but did make progress on my Vogue 2770 jacket pattern. 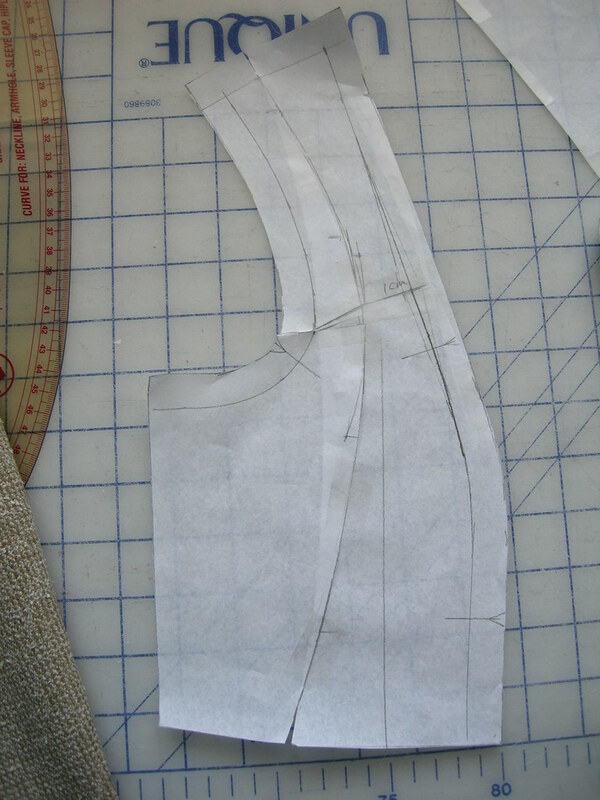 Again, I'm muslining (if that's a word) and altering the pattern for better fit. The fabric I'm planning to use is a really great wool blend purchased at Couture Elle in Montreal, and I want the garment to measure up to the fabric. 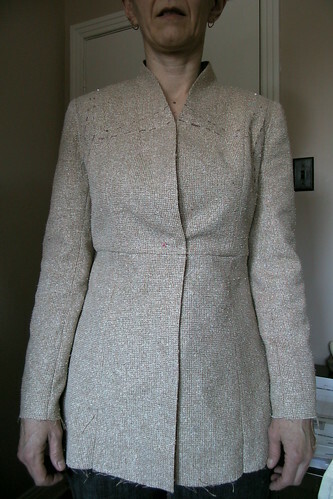 This is a straightforward shoulder princess seamed jacket with a sort of a combo-stand-shawl collar. 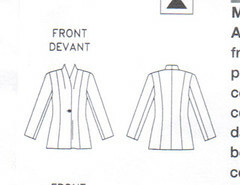 The darts which extend from the shoulder-neck point make it appear that it is a banded collar. It is very simple. However, just as with the little top that is included in the pattern, a muslin revealed some fitting problems that needed correction. 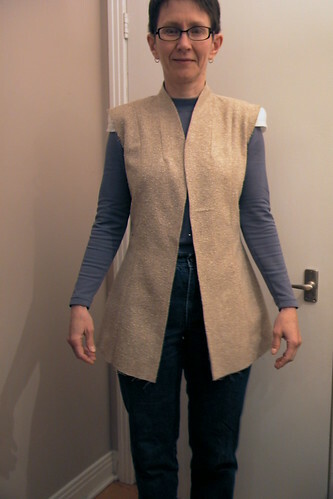 Here is the un-altered pattern without sleeves, cut out of a suitable jacket-weight "junk" fabric (and this one really is headed straight to the garbage after I'm done with it). This muslin reveals again that the CF area is too long for my body. See how it falls away from the CF at the hem? That's the clue. 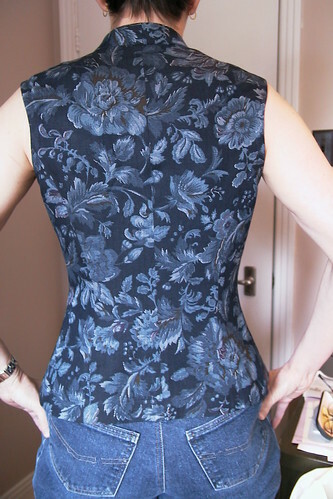 If I pin it at the waist, as if buttoned, I can make the front edges vertical, but then it sags unattractively above the waist, as you can see in the next picture. 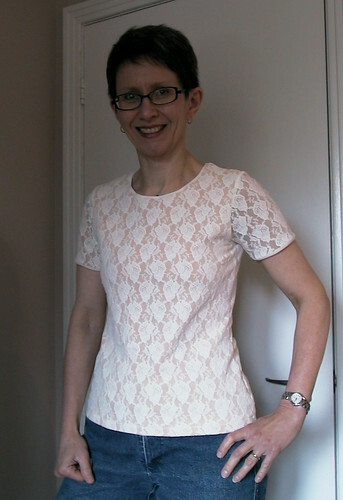 I need another of those tucks in the neckline area (just like I did in altering the little top). Also, it is too wide across the front at the shoulder level - see those vertical wrinkles? The shoulder pads are too big, but there's a lot of extra width and the wrinkles get worse when sleeves are added. 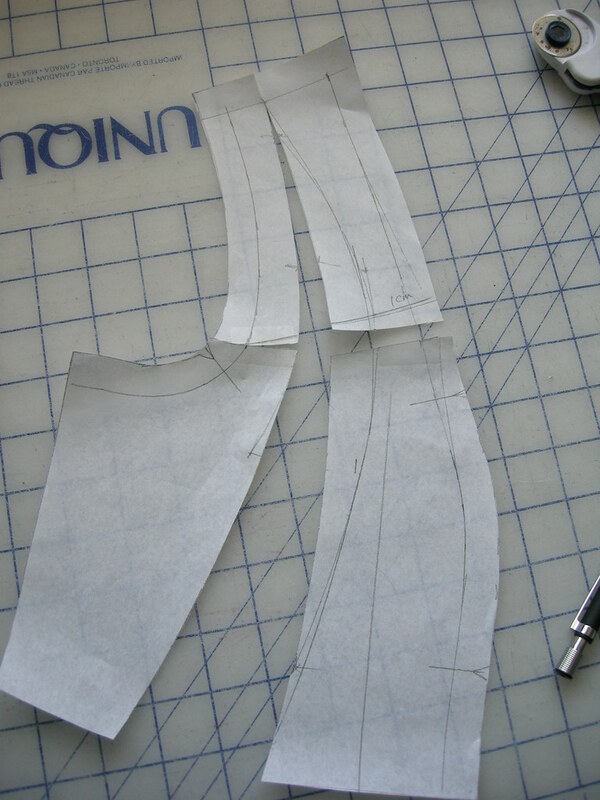 What appears (at left) to be a seam at waist level is actually a tuck - the hip shaping on the jacket was too low, and since the jacket itself is extremely long, I shortened it by taking it up 2cm (.75"). To fix the sagging and excess fabric, I started pinning out tucks. To the right you can see what it looked like when I had finished doing that. The horizontal tuck takes a whopping 3cm of length out of the CF above the bust! The vertical tucks (parallel to the armscye) take out another approximately 2cm of width on each side. This photo also shows how long I plan to make the jacket. What do you think? 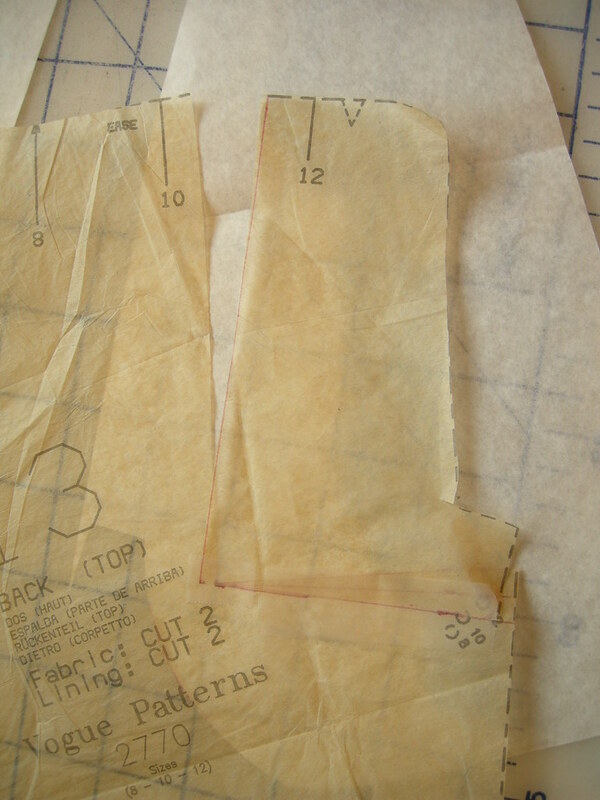 I marked these tucks directly on the muslin fabric again (as you can see in the first, saggy picture). Then I transferred them to the pattern tissue. First, I traced the upper part of the front pieces. On the CF piece, I started by folding the dart closed and marking the tuck/wedge. I then opened the dart, overlapped the tuck, and re-drew the dart so its legs were straight, as you can see in the photo to the right. I also had to take care of smoothing out the neckline to a pleasing curved shape, and cut off the little point at the princess seam that was created by folding out the wedge. That was easy! The side front alteration is way more complicated. 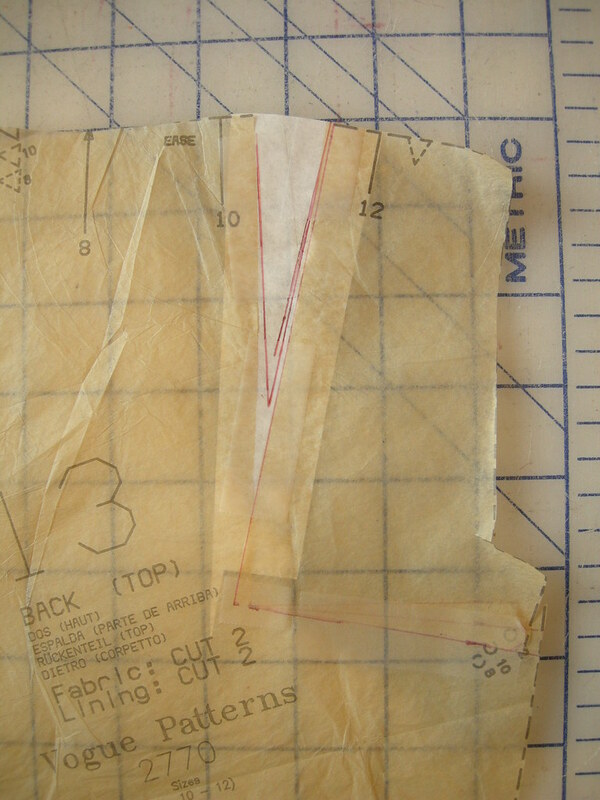 Again, I started by drawing the shape of the tucks I had pinned out onto the tissue. The crescent tuck is rather bizarre looking! 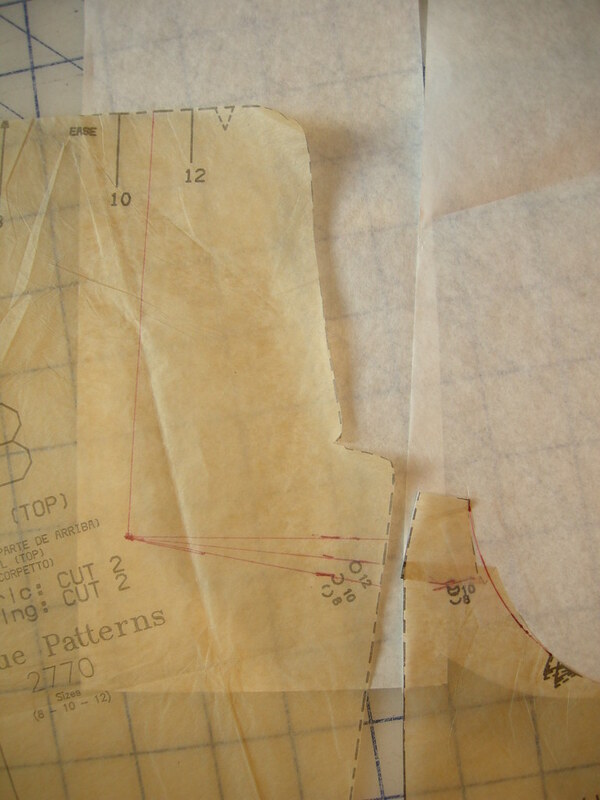 The next step (at right) was to cut along the marked lines. Then, I overlapped the pieces. Moving the armscye towards CF meant that the leading edge of the marked crescent had to open, while overlapping the horizontal tuck meant the two pieces were again the same length. Like magic, I tell ya! Again, I had to true up the princess line. The little bit I had to add here was about equivalent to the little V I had removed from the CF piece. 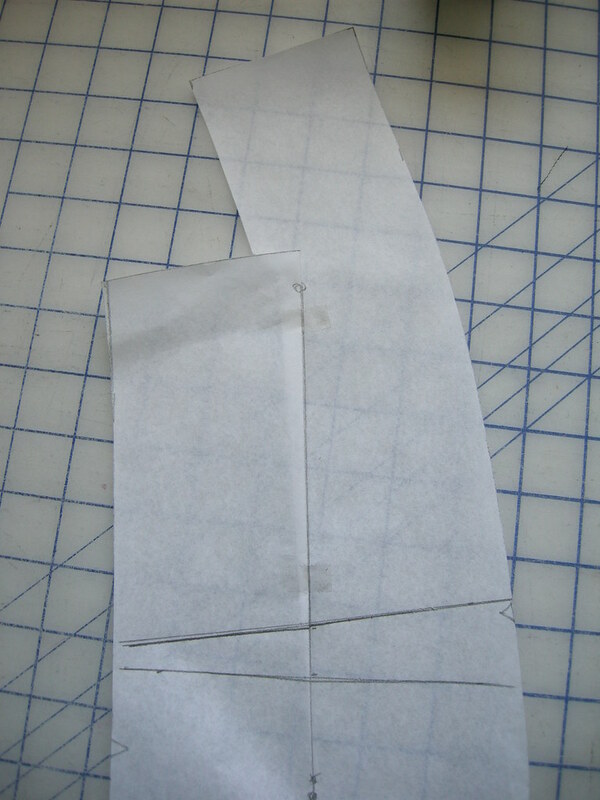 I knew this ought to work, but wanted to test it in fabric before cutting into my good fabric. So I took the muslin apart enough to sub in new upper front pieces. The fit is pretty good, if I do say so myself - I think I'm about ready to take the pattern to the good stuff! New patterns and fabric chosen. I took advantage of a Vogue sale at the Fabricland last week to acquire the two new Kay Unger dress patterns. One of them is destined to be my "not-necessarily-black-not-necessarily-a-dress cocktail outfit" for the upcoming PR Weekend in Montreal. Very Special Fabric has also been purchased. So exciting! All shall be revealed in due course. I think I'll blog about my muslin/fitting but maybe not about the dress itself until after it has been duly unveiled at The Event. Is that silly? I also bought two of the newest Jalie patterns - the famous and, by all accounts, fabulous 2908 (women's stretch jeans) and the almost equally highly-regarded 2921 (scarf-collar tops). I still have enough heavy blue denim for a pair of jeans, if not two, and multiple rayon jersey prints. The hardest part will be choosing which one(s) to use. 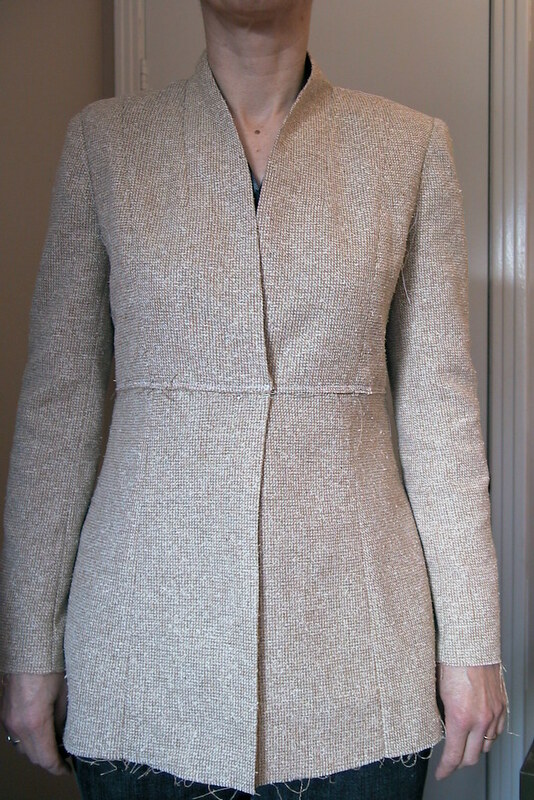 But first, I'm muslining the jacket from Vogue 2770. I'll post some progress photos later in the weekend, so stay tuned. I decided to try my adjusted pattern using some "junk fabric" before cutting into anything good, and part way in I decided I could really get to like it so should do it properly. After all, it's really only "junk" because of its provenance (thrift shop find). I might actually have bought it if I'd seen it in a fabric store (soft rayon, nice blues, acceptable floral print over an interesting herringbone weave). Overall, it's unfortunately a little bit longer than the jacket I was thinking I'd wear it with. I will shorten it slightly when I make it again. 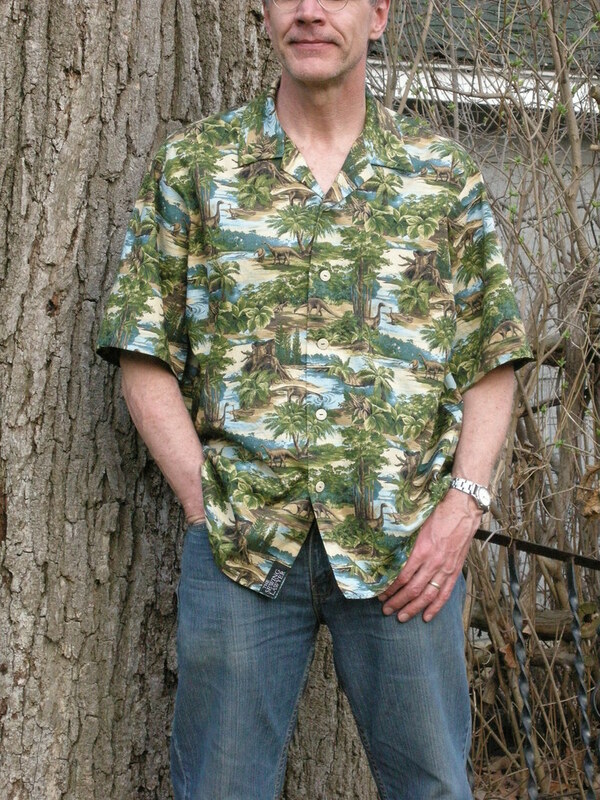 I have some really great tie-dyed cotton of African origin that suddenly shouted that it could be this top. The front alterations were a success. The V neck is now the right length and doesn't cause gapping, after I took that little 1.15cm wedge out of it. Also, the excess fabric at the front princess seam is a thing of the past. 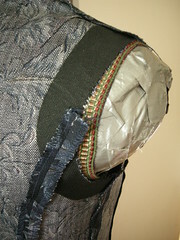 The armscye was stabilized with a 3cm strip (cut to match the armscye curve using the pattern pieces) of fusible interfacing, as you can see in the next photo. 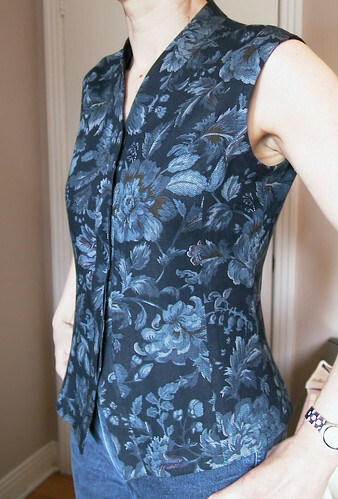 The other noteworthy feature of this little top is the concealed button placket. To the right is a picture, before the buttonholes were installed. I used silk organza for the inside finish because it would add no bulk. To the left is a view after the buttonholes were installed. I also tacked the edges together between buttonholes to prevent gapping. Finally, the back. The darts worked brilliantly to eliminate the gapping at the armscye. 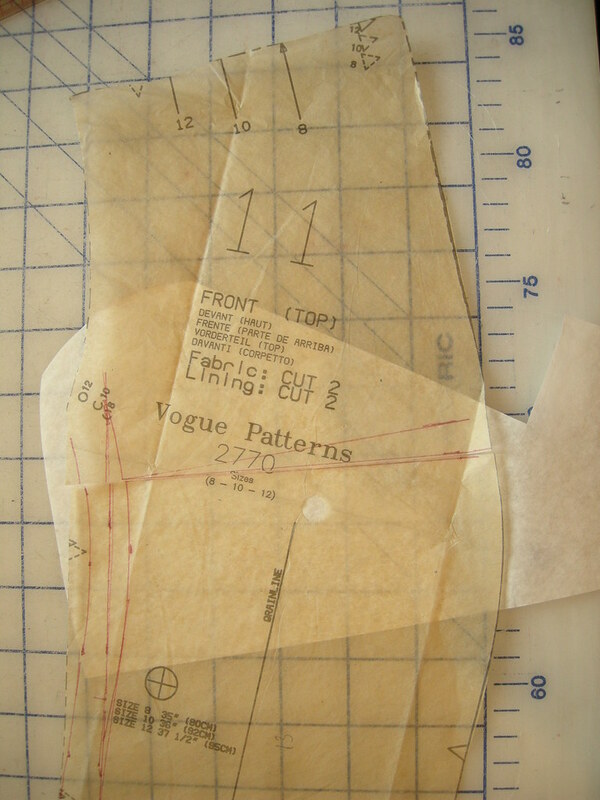 I promised to show you how I transferred the changes I noted on my muslin for the Vogue 2770 top. 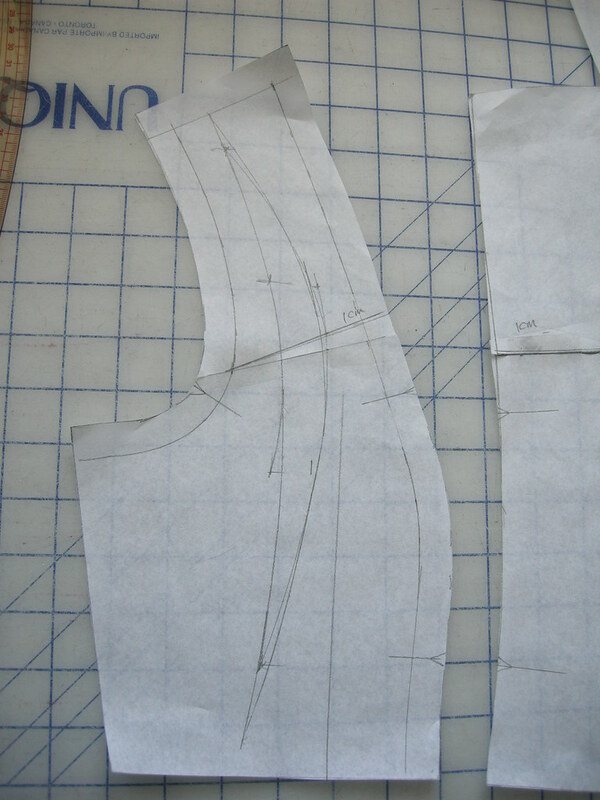 In the front, recall that I pinned out a wedge with the wide end at the V neckline and the point at the princess seam. This is to shorten the gappy front neckline. The other change was that I pinned out a little of the extra fullness above the bust, at the princess seam where it curves into the armscye. Here's how these changes were marked on the muslin (click on the photo to enlarge it so you can see the detail). I used a fine marker to draw the wedge and fisheye shape directly on the muslin fabric. When you're pinning out extra fullness on the body, the changes are not necessarily symmetrical. I drew the changes I had made on both sides and, where they weren't quite the same, I made the smaller of the changes on my tissue. You can see I noted the size of the wedge at the front band (1.15cm). On this next photo, I've transferred the changes to the tissue for the front piece. I also cut through the piece at the lower edge of the wedge. The next step is to close the wedge by overlapping the lower line on the upper one, and taping the tissue in the new location. 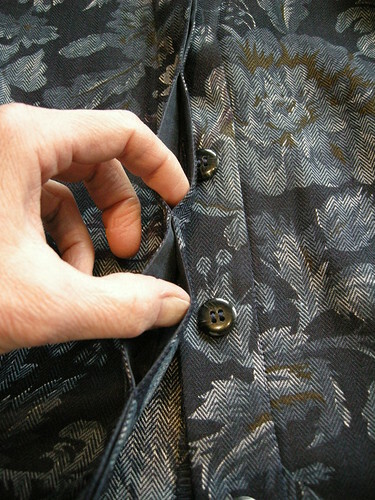 The effect is to shorten the front edge by the desired amount, while leaving the princess seam length the same. 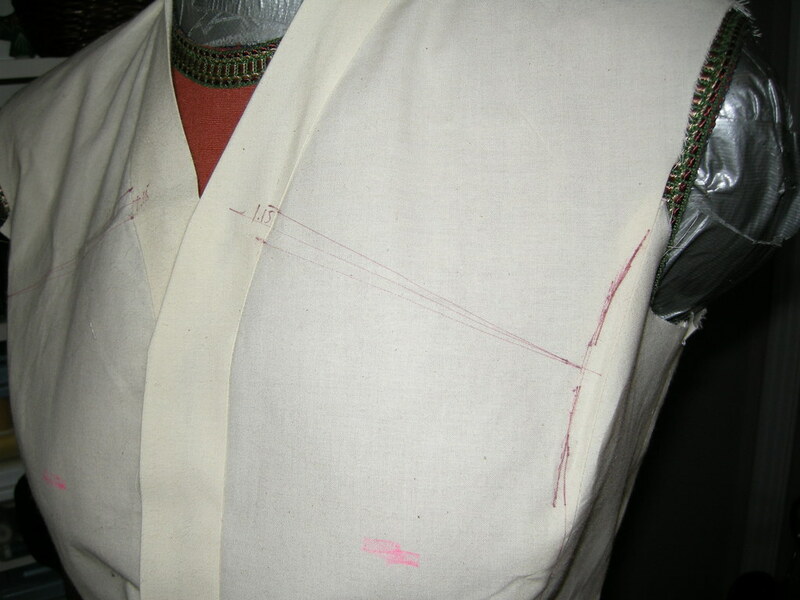 The other thing I did on this piece was to add a smidge of length over the bust, because the muslin was tight. I did this by opening up another wedge, but this one has its point at the front edge and its wide end at the princess seam, making it longer. 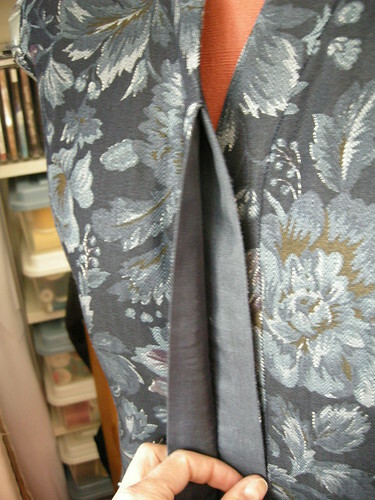 This extra length will be eased into the side front piece which I left unchanged. You might ask, doesn't this wedge undo the effect of the other one? It does not! In each case, I'm reducing length or adding it where it is needed to fit my body. In this photo you can see I've added tissue where needed. After I cut the new fisheye above the bust I didn't like the line of the seam so I made it a little less indented there. I also added a thin piece of tissue at the CF, since the slight rotation to add length at the bust meant that the line was no longer straight. 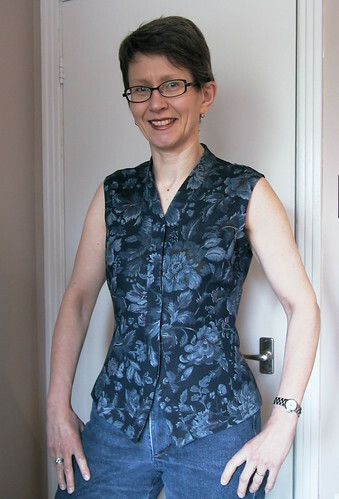 Recall that in the back, I had a little excess length at the lower armscye which I had pinned out. Here are the changes I made to the back pieces. In this first photo, I've already overlapped the wedge I drew on the side back piece, and have taped it down. The rest of the alteration appears as a dart at a corresponding place on the CB piece. Now, I could actually sew that dart, but it's a pretty strange place for one. I'm going to rotate it to the shoulder instead. You can see I have drawn a line heading up from the point of that dart to the shoulder seam. 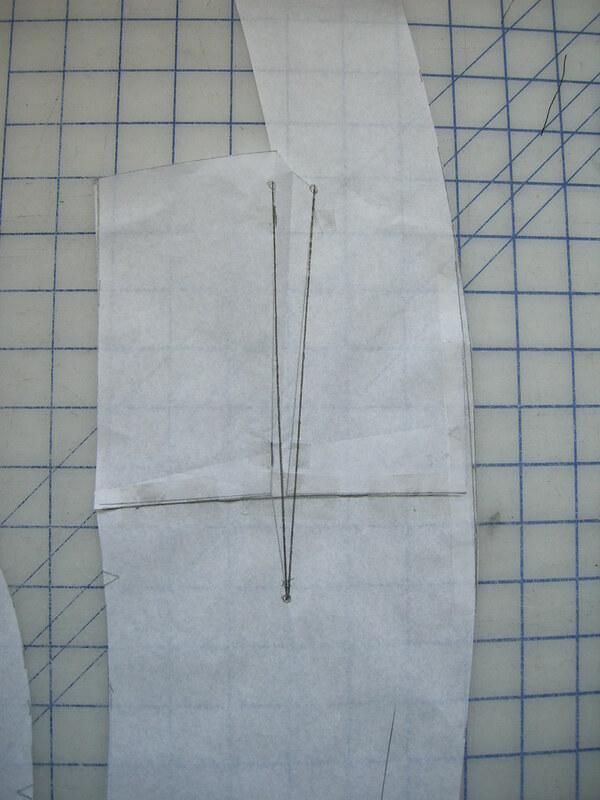 The next step is to cut into the pattern along that line, and then out to the princess seam along the upper leg of the marked dart. Here is the result. I have overlapped the dart which opens up an apparently much bigger dart to the shoulder line (it is bigger at the upper edge, because it's longer, but the angle of it is the same). I've reduced the size of it slightly by moving the corner piece in, towards CB, so that the corner overlaps the rest of the tissue by a small amount (click on the photo and you'll be able to see what I mean). The next step is to tape some extra tissue underneath the new dart, and draw it in. I've made it slightly shorter than the actual wedge. The resulting piece is the same width as the original, and the new dart eliminates the gappy little wing effect I had at the back armscye. I'm mostly done sewing the top using this adjusted pattern, and I'm very pleased with the fit! There are alterations, which I'll post about later, but also dinosaurs. The dinosaurs are the ones on the cheery Aloha shirt I made my husband for his birthday. His is the only dino-Aloha shirt in the city; I would lay money on it. And if there is another one, the print definitely does not match across the fronts, or on the pocket. Harumph. Since it's crazily, unseasonably warm here at 27C or about 80F, he modelled it for me outside and then we went for a walk. If you click on the photo it'll enlarge so you can admire the print!